The encouragement of an understanding and acceptance of the spiritual and moral basis of life. 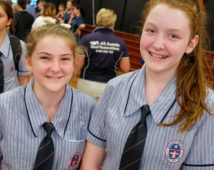 The development of responsible citizens with a willingness to serve both their fellow students and the wider community. Students can contribute to a number of social justice and fundraising initiatives as part of their Tutorial group. 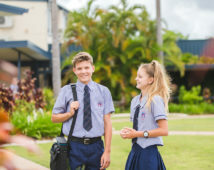 In conjunction with the Student Council there are a number of fundraising activities throughout the year for organisations such as Caritas Australia, numerous relief efforts and annual Lenten and Christmas appeals for those less fortunate in our community. 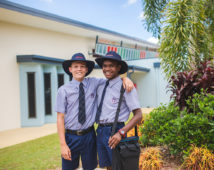 Emmaus enjoys a proud history of strong participation in community events including: the Leukaemia Foundation’s Shave for a Cure; the Salvation Army Red Shield Appeal; and Clean Up Australia Day. 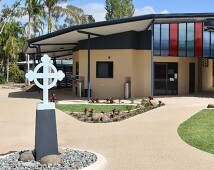 Students are given opportunities to establish links with the community such as: volunteering time to the Jason Rich Foundation to participate in defensive driving training; renovating garden areas at neighbouring aged care facility Leinster Place with the Emmaus College Eco Club; annual blood donation with the Australian Red Cross Blood Service at Rockhampton Hospital; and engaging with students at our three Northside Catholic primary schools to increase social conscience and collaboration. Support for those who are struggling in our College community is provided by our Hope and Healing Fund. Students and staff support the Fund, which has been of great use to individuals and families who have faced challenges in the past.